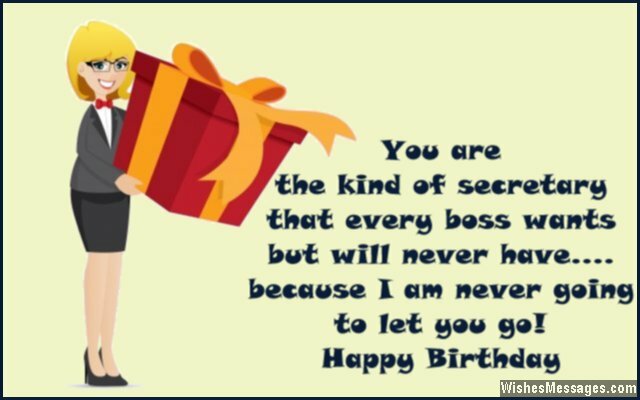 Birthday Wishes for Secretary: What can a boss write on a greeting card to wish his or her secretary a happy birthday? Take ideas from this post for inspirational messages and funny quotes that can be used in a professional environment. Efficient and organized personal assistants do most of the administrative leg work for their bosses but their efforts often go unappreciated. Their birthdays are the perfect opportunity to compliment, appreciate and thank them for all their hard work, with a short speech. Gather all your colleagues, co-workers, team members and bosses to celebrate the birthday of a person who is actually the life of the workplace. 7) I wouldn’t have bothered learning Time Management during my MBA if I knew I would be getting such an efficient secretary like you. Happy birthday. 8) You are the boss of my schedule, supervisor of my task list, manager of my appointments and the chief of my calendar… now we know who the real boss is between the both of us. Happy birthday. 9) To get things done, this office practically has no need for a boss like me as long as it has a secretary like you. Happy birthday. 10) Steve Jobs, the perfect innovator. Justin Bieber, the perfect pop star. Warren Buffet, the perfect investor. Michael Jordan, the perfect ball player. Mark Zuckerberg, the perfect internet entrepreneur. You, the perfect secretary. Happy birthday. 11) The company may be giving you a monthly wage… but for me, you are just priceless. Happy birthday. 12) I am punctual, efficient and organized not because I am the perfect boss, but because I have the perfect secretary. Happy birthday. 13) The economy doesn’t need more funds and new policies to keep it afloat. The nation simply needs more secretaries like you… who keep reminding their bosses what to do. Happy birthday. 14) Expecting the office to function normally without a secretary like you is like expecting a plane to fly by itself without a pilot. Happy birthday. 15) You are the most highly qualified secretary because you seem to have a Bachelors degree in Motivation, Masters degree in Enthusiasm and a PhD in Positive Attitude. Happy birthday. 16) You are the kind of secretary that every boss wants, but will never have because I am never going to let you go. Happy birthday. 17) The most important asset which I use to get work done is not my skill, education or work experience… it is you, my efficient secretary. Happy birthday. 18) CEOs, managers, business executives take all the credit for a company’s success. 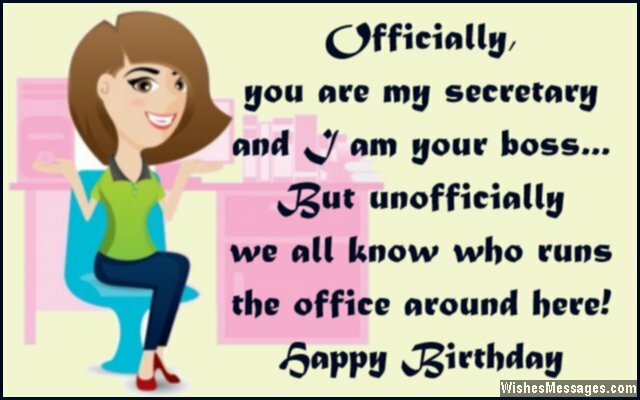 But deep down inside they all know the real secret – efficient secretaries like you. Happy birthday to my secret of success. 19) Our office would be less of an office and more like a jungle if it weren’t for you. Happy birthday. 20) I will never need to look at my watch or glance at the calendar as long as I have a secretary who keeps reminding me what to do and when to do it. Happy birthday. 21) Who needs android and iOS apps like Evernote, Dropbox, eWallet, Things and Remember The Milk when the office has a super efficient and super organized secretary like you. Happy birthday. 22) The flowers, gifts, chocolates and cake we have got for you are no match for the way you make every day of our lives a treat with your organization and efficiency. Happy birthday. 23) The best decisions I have made in my career are not the million dollar deals that took the company ahead. The best decision I have made is to recruit an organized, efficient and punctual secretary like you – whose organization skills made those million dollar deals a possibility. Happy birthday. 24) I wouldn’t know if it was morning, afternoon or evening if you weren’t around to manage my time. Happy birthday. 25) Managers like me don’t need smartphones, tablets and laptops to stay organized. All they need is a superb personal assistant like you. Happy birthday. 26) I will never change my job, I will never ask for a promotion and I will never ask to work in another department of this company – only until the day you are my secretary. Happy birthday. 27) I would like to raise a toast on your birthday but I have no idea where the glasses are kept in the office. That is how handicapped I am without your efficiency and organization. Happy birthday. 28) A secretary like you to a boss like me, is like a hot cuppa is to a coffee lover – impossible to start the day without. Happy birthday. 29) The only motivation successful bosses and teams ever need is the inspiration of watching a hard working secretary like you. Your zeal and enthusiasm at work gets everyone pumped up. Happy birthday. 30) You take my calls, you fix my meetings and you get to decide all my other plans for the day. I am practically just a puppet and you are the puppeteer. Happy birthday to my secretary. 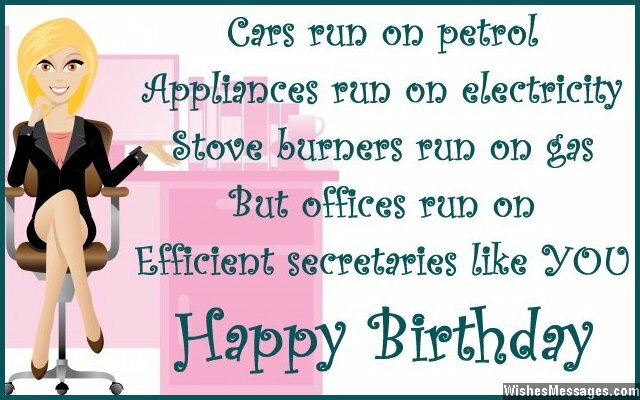 31) Cars run on petrol, appliances run on electricity, stove burners run on gas… but offices run on efficient secretaries like you. Happy birthday. 32) I walk around the office like the king of the jungle, but we all know that without your help I’d be nothing more than a lost kitty. Happy birthday. 33) Happy birthday to the woman who has the power to unleash havoc in my office by just being absent. 34) Any restaurant would come to a complete standstill if the chef didn’t show up for work. Our office too would come to a halt if the most efficient employee didn’t show up to work – you. Happy birthday to my secretary. 35) My wife is jealous of you because you are the only woman in the world who I trust completely with my schedules and appointments. Happy birthday. 36) You are not just my secretary. You are a shield that hides my all my flaws including procrastination, laziness and inefficiency. Thanks for concealing your boss’ true identity. Happy birthday. 37) The biggest mistake most bosses make is not hiring an efficient secretary like you. Happy birthday. 38) The Certified Professional Secretary examination committee needs to come and include all your skills, abilities and talents in their coursework. Happy birthday. 39) If I am the CEO, you are my shadow… and that is all I want you to know. Happy birthday. 40) Even the highest paid bosses in the world aren’t worth a penny of their massive salaries if they are not backed up by efficient secretaries like you. Happy birthday.